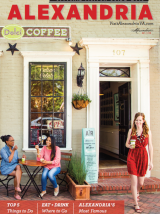 "Shop, Dine and Celebrate on America&apos;s Historic Main Streets"
Alexandria, VA -- The Alexandria Convention & Visitors Association reports a $4 to $1 return on investment to the City of Alexandria in tax revenue for their full page magazine advertising campaign. Visitor spending jumped 16.8% in a period when visitor spending increased an average of 7% in Virginia, dramatically outpacing regional neighborhoods. Based on this strong return on investment, $100,000 in additional funds were earmarked in the City Manager&apos;s budget to increase the reach of this campaign. The research began with one-on-one interviews and focus group discussions with stakeholders. During the second phase, 1400 online surveys were completed by leisure and business travelers. Phase three focused on community input and almost 400 citizens completed the survey. Magazine advertising appears in northeast regional editions of Cooking Light, Real Simple, Town & Country, Travel + Leisure, Elle Décor, Southern Living, Preservation Magazine, American Heritage and AAA World. Headlines used in the ads include "The Artful Getaway: More of what you love for less" for the fall, "Wonder-Land is closer than you think" for the holidays, and "Charm-Ville is closer and more affordable than you think" for the spring. In 2010, a third party research company measured the return on investment to the City. Within six months, the advertising created $4 of City tax revenue for every $1 invested. The study found the advertising generated $40 million in visitor spending and motivated 88,000 trips. 1.4 million households in target markets were aware of the advertising. In 2011, advertising drove 800,000 visits to the City&apos;s tourism website, VisitAlexandriaVA.com, an increase of 100% over 2008. The website is expected to reach 1 million visits in 2012.